11.5mm x 20" New England Tachyon Hip Prussic With Steel Snaps. Hip prussic are comonly used to length adjust berank style lanyards but have a many other uses. Constructed using New England Ropes 11.5mm climbing line. 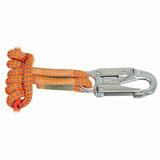 The 5M test double locking steel snap with New England new "Sewn Eye" eye splicing technology.